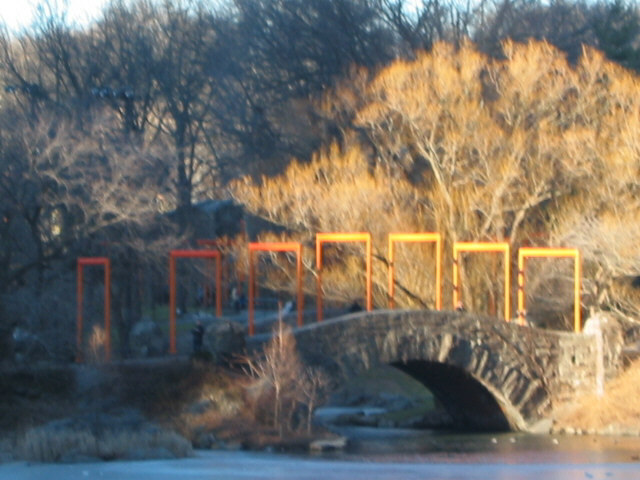 The official title -- "The Gates, Central Park, New York, 1979-2005" -- refers to the artists' conception of the idea 26 years ago. 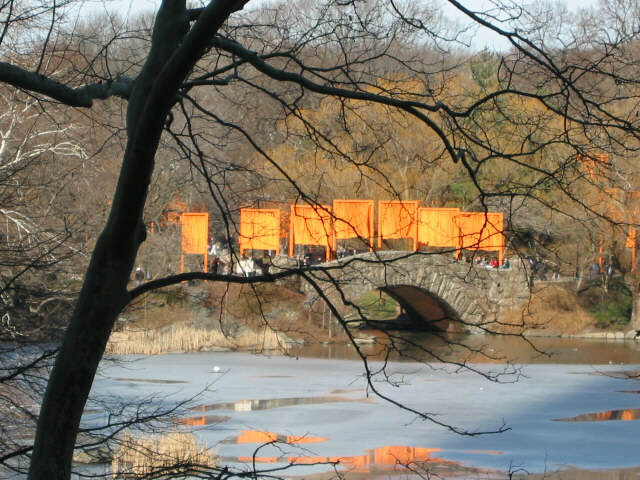 Celebrated artists Christo and Jeanne-Claude unfurled THE GATES, PROJECT FOR CENTRAL PARK 1979-2005, on February 12. 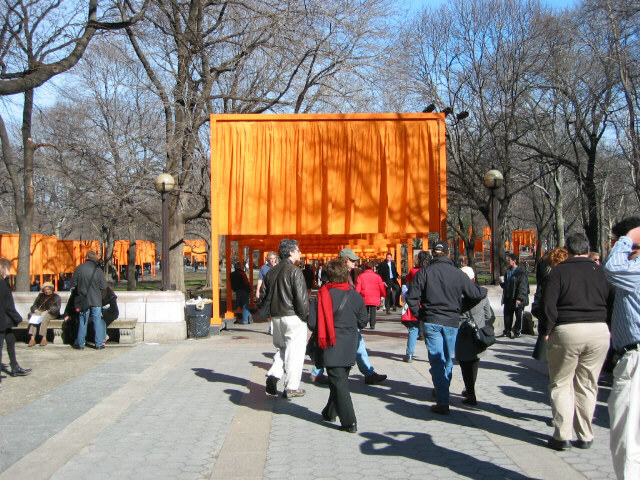 On Friday, February 11 at the top of the gates, were bundled up, 1,089,882 square feet of saffron fabric. On Saturday, February 12 the cocoons were opened to reveal fabric panels hanging seven feet above the ground. The Gates Project is not just a great Art Exhibit; it is an opportunity for teachers to integrate Art with Mathematics and Science. What are all those numbers about? • 5,290 US Tons of steel (4,799 Metric Tons) (10,580,000 pounds) for 15,000 specially designed steel footing weights, varying between 611 and 837 pounds each, according to the width of the gate, (278 - 379 Kg.). The weights are resting on the hard surface of the walkways. There are no holes in Central Park.
. • 15,000 (1/2 inch x 8 inch x 8 inch) (1.27 x 22,8 x 22,8 cm.) steel leveling plates. The leveling plate are between the base anchor sleeve and the steel base.
. • 116,389 miles (187,311 Km.) 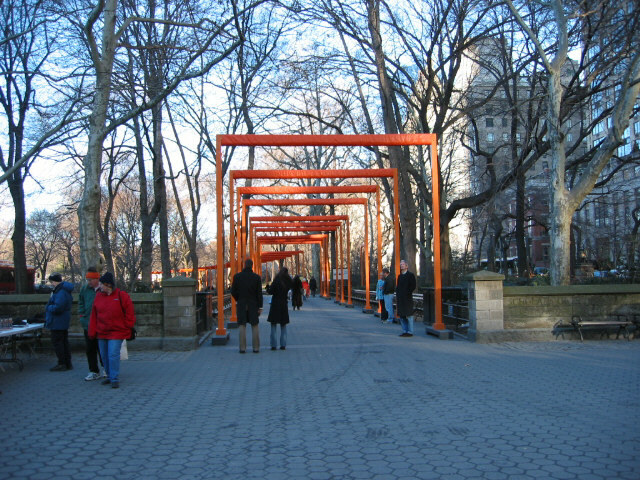 of nylon thread in saffron color and specially woven into 1,092,200 square feet (98,298 square meters) of recyclable, rip-stop fabric were cut and sewn into 7,500 fabric panels of various widths. 46 miles (74 Km.) of hems. Do you know your conversions Metric <> US? How many pounds in a ton? How many centimeters in a inch? How many feet in a mile? How many pounds in a kilogram? How many square feet in a square meter? What keeps those gates from flying off? 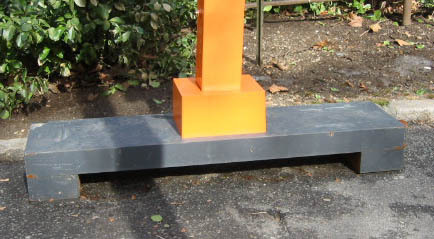 The dimensions of the base shown is: 48" (length)x 12"(depth) x 6"(height), Each base is actually made of three blocks (see image).The top solid block is 48" x 12" x 3". The two feet are each 6" x 12" x 3". The above base was made from large plates of steel. A total of of 809 steel plates were manufactured at the ISG mill in Coatesville, PA.
What was the volume (in cubic centimeters) for this large block of steel? What was the mass in grams for the large block? What is the density of the steel used in this project? What is the weight of the base shown above? There are several ways to approach this problem; we present two methods here. See if you can come up with other methods. You are working with very large numbers and will most likely need a calculator. THEN SOLVE THE PROPORTION FOR THE MASS OF THE BASE. What is Steel? The Different Types of Steel. Click for Converter to convert length between units. Make sure all pop-up windows are closed or visible. Click for Calculator. A pop-up window will open with a calculator. Make sure all pop-up windows are closed or visible.